I haven’t played in any chess tournaments since winning this year’s Pittsburgh Chess Club Championship: I had too many other projects I wanted to work on. But I’ve been missing chess in the past week or so. I can tell because I’ve been playing chess against myself in daydreams. I think I need to start playing again. 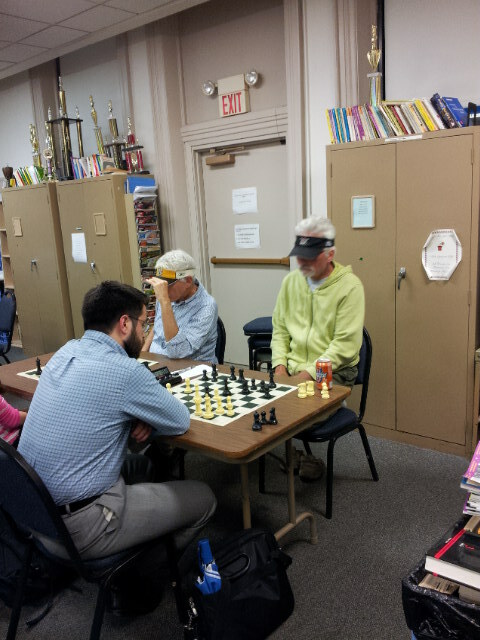 I stopped by the Pittsburgh Chess Club to check out the action. Henry was playing against Ed Dean; I wanted to say hello, but he didn’t even see me during the several minutes I was present watching people’s games. He was so focused and deep in thought, never looking up! Henry actually ended up winning the game, in a big upset! It’s funny, he’s beaten Ed Dean twice now, while I have never beaten Ed, and Henry has never beaten me.